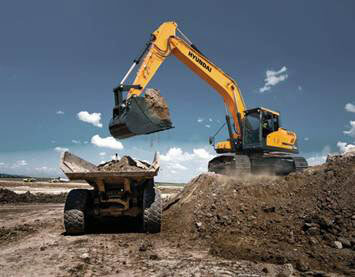 Hyundai Construction Equipment Americas has launched the HX series of Tier 4 Final-compliant hydraulic excavators in the United States and Canada. The first models, which range from 22 to 52 metric tons and include the HX220L, HX260L, HX300L, HX330L, HX380L, HX480L and HX520L, are hitting the ground now. Smaller models and compact-radius models will follow in 2016. 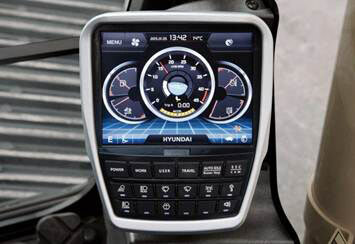 Most notable is the all-new 8-inch (20.3 cm) interactive, adjustable, touchscreen cluster-monitor with haptic remote control for all major functions, easier operator accessibility and better ergonomics. The haptic remote control delivers reactive, tactile sensations using vibrations and pulses to guide the operator through menu selections. The new cab also features a more powerful, climate-control system with improved air efficiency and temperature response, 15-percent more capacity, improved defrost capacity and more airflow mode selections for optimized operator comfort. Other innovations that make the new Hyundai HX cab exceptionally comfortable for the operator include 13-percent more leg and foot space from the seat to the pedals, reduced in-cab sound level, optional single-pedal straight travel, new heated operator’s seat with standard air suspension and integrated console, Bluetooth audio system, Miracast wireless functionality for viewing a mobile device screen on the monitor, hot/cold storage box, sunglasses compartment and a large storage box with a retention net for personal items. 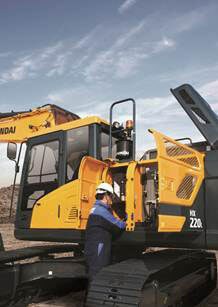 Enhanced reliability features on the HX Series include reinforced longer-life pins and bushings coupled with wear-resistant polymer shims and newly designed cab shock mounts with dual shock absorption for reduced vibration and noise, which also improves operator comfort. Serviceability enhancements include ground-level access to the fuel filter and convenient exterior access to the cab air filter. Additional guard rails provide greater safety while performing maintenance and inspections on the upper structure deck.